Not much consumed on Thursday or Friday this week. I did finish Grant Morrison’s Joe the Barbarian and the first issue of Brian Vaughan’s Y the Last Man. The Morrison comic is terrific stuff with wonderful art. I do want to re-read it before saying too much more, though. We also watched Brad Pitt in Moneyball, which I liked very much. Everything else for the last two days has been work, though. Tuesday and Wednesday were quiet days, reading and watching-wise due to work commitments. I did finish reading Rick Riordan’s Percy Jackson and the Lightning Thief, which I mildly enjoyed. I suspect my reaction to the book has to do both with it being aimed at a slightly younger audience and that I grew up watching Hercules cartoons before moving on to Xena et al, so the whole idea seemed rather familiar. Reports are that Miss 10 is enjoying it greatly, though, so when she’s finished we’ll chat about it. Other than I read two more issues of Grant Morrison’s Joe the Barbarian, which I continue to enjoy, and caught up with episode 6 of Kelsey Grammer’s Boss. While I’ve been engaged be the series to date, this is where it gripped for me. It was a bit darker, a bit more violent, and certainly more compelling as Kane’s world begins to unravel quite seriously. Not sure where to next. I have some bits and pieces of TV to watch, a few comics to read, an ENORMOUS pile of books that I’m not looking at, and some other stuff. I was pleased to see the new issue of Subterranean starting to appear. Bill’s magazine has consistently been amongst the frontrunners for quality fiction over the past couple of years, so more is welcome! … a quiet day. I read part of Percy Jackson and the Lightning Thief, which I bought on the Kindle when I was traveling back in October. Sophie started reading it on her new Kindle Touch, and before I knew it we’d agreed we were in a competition to see who could finish first, and to see if we’d have anything interesting to say about it when we were done. I also read issue 1 of Azure, a digital SF comic by Daniel Govar, that didn’t much interest me. Work reading-wise, I read the February Asimov’s, which features a strong novella by Robert Reed, “Murder Born”. I’d already read a lot of good things about the story, but found myself not quite as impressed. The main piece of culture, though, was Marianne and I watching ep 1 of Seasojn 2 of the the BBC’s Sherlock, “A Scandal in Belgravia”. While it was problematic in some ways, I still enjoyed it enormously. Finally, as an aside to this post, my thanks to all for their kind birthday wishes. They were all enormously appreciated. One of the things I’m toying with is posting a brief diary of the new “culture” consumed every day. I find I look back and can’t always pinpoint when I read something, hence this. There are some possible exceptions. I don’t know that I want to include anything here about short fiction I’m reading for the year’s best because it conflicts with Last Short Story, and because it seems like a fairly poor idea. I also won’t post about some novels. Every now and then manuscripts fall into my hands, legitimately (! ), and it’s best not to comment publicly on them until a more appropriate time. With those two caveats, though, here’s the rather passive amount of culture I consumed on a holiday Sunday when I slept as late as I have in three years, and when we did go swimming for a while. I’m been watching the first season of Kelsey Grammer’s new political drama, Boss. For those unfamiliar with it, Grammer plays a mayor of Chicago diagnosed with a degenerative neurological condition. The script is tight, the cast is good, and the stories work. I’m not 100% I love it, but I find myself compelled to keep watching, which is a good sign. I also watched the final two episodes of season two of Downton Abbey. Somehow I seem to have watched most of Downton Abbey on planes – season one on the Reno/WorldCon trip and most of season two on the NYC/LA/World Fantasy trip – but I’d not quite finished till last night. It’s a real soap opera now, and I’m not as impressed with s.2 as I was with s.1, but it still the right thing for the day. Finally, during 2011 I purchased an iPad. That lead to me dipping my toes into the world of comics. I’ve never been an active comics reader, having read a small number of superhero comics as child, then Neil’s Sandman and Dave Sim’s Cerebus later on in life. Everything else passed me by, but James Bradley had me check out and rather enjoy Warren Ellis’s Planetary, and it got me interested enough to dabble. 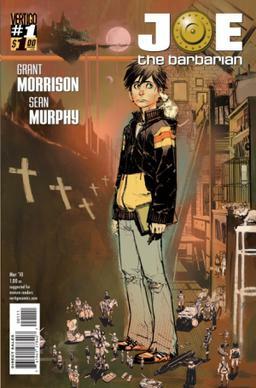 Yesterday I read the opening three issues of Grant Morrison & Sean Murphy’s Joe the Barbarian. I’d seen the omnibus in Planet, but don’t really want to get into acquiring physical comics, so was happy to read it on the iPad. The story, of a young boy going into some kind of insulin shock and either seeing or hallucinating a great universe-saving epic adventure is pretty cool, and the art is great (though I sometimes seem to find comics panels generally confusing). I also tried issue 1 of Brian Azzarello and Eduardo Risso’s Spaceman. I think I want to re-read it before posting more on it. That’s my culture for 1 January. I’m not expecting to add much to it today. It’s my birthday and I expect demands for my time will distract me from things, but we shall see.